The ZENBOOK has great specs and a lean body (at less than an inch). Also, with features like auto-saving open files to prevent data loss and resuming action from the sleep mode within just 2 seconds, it can definitely give the MacBook Air a run for its money. Additionally, the audio has been provided by Bang & Olufsen ICEpower SonicMaster, which basically means that the sound will be awesome. It is one of the thinnest 15 inch laptops in the world. This one has less mass and more appeal, and the company touts it as a device which is 'beautiful outside and powerful inside.' Dell has also expanded its ultra-thin series of laptops with devices like the XPS 14z. The super-thin laptops from Sony are handy devices for those who choose style, love size zero and have deep pockets. And with additions like Speed/Stamina button (for quickly shifting between better performance and longer battery life), VAIO button (gives control of multimedia content with hand gestures), WEB button (one-touch access to the Internet) and ASSIST button (links directly to VAIO Care software), Sony has hit all the right chords. The new MacBook Air Series features the latest Mac OS X Lion and includes a Thunderbolt port for lightning-fast file transfer. The company has also added a backlit keyboard (for typing in low-light conditions) and the keyboard is a full-size one, instead of a condensed one featured in the earlier versions. 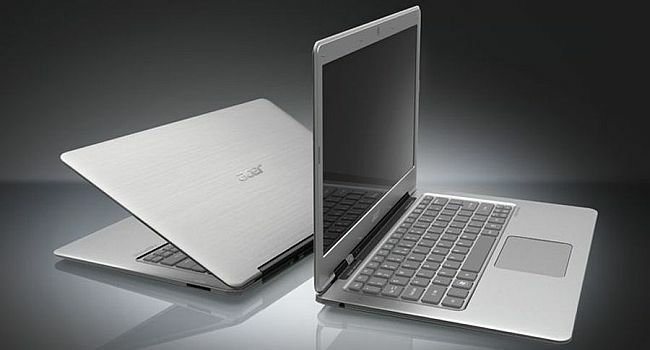 The first Ultrabook offering by Acer is ultra-portable, high on specs and includes additional features like Acer Green Instant On (puts the laptop to sleep and spring it back to life in less than 2 seconds) and Acer Instant Connect (enables faster Internet access) â€“ making it quite a compelling product.